I was wondering if it's possible to have a chess position in which the (or at least ONE OF THE) OPTIMAL strategy/strategies causes the pieces in the board to mirror in some way, or to rotate with respect to the board. EDIT: Let's confine to a few pieces (as few as possible, ideally 3 to 5) and no pawns, because they are quite anti-symmetry. The position need not to follow a real game, that starts from the initial chess board position. Note: Since the gae will cycle, the game result will be draw. EDIT 2: We can relax "optimal" to this: the 50 move rule doesn't apply. Optimal moves are ones that "do not ruin" the position (make the result worse than what itis converting draw into loss). It doesn't matter the "speed", only the result, if a method draws in more moves than another, it's ok, it's still accepted because it draws at least. White has only one move, Qe8+, to avoid losing the game (any other move will give Black a mate in at most 3). After making this move, Black has only one legal move, Kh7. Now the position is a mirror of where we started along the a1-h8 diagonal. I don't think it's possible to use this general idea with fewer pieces, as then Black would have insufficient material to be able to punish White for deviating from the strategy, so it's hard for White to have a forced move. The answer is no under the following assumptions. Some of them do only apply to very strong players. If you define things a bit different you might get different results. So this is of course not the last and definite answer to the question! 1.: An optimal strategy in chess aims to improve the own situation which means improve some score S(t) (which I will leave to you) or prevent the other side from improving the situation (aka the score) in the future. Improving the situation means, that your new situation keeps the result of the actual situation in case both parties follow the best strategy (here are the strong players) while making it more likely to win (or not lose in case you currently have the lower score) if the other player does not follow the optimal strategy. 2.: The score does only depend on the figures on the board and not on the psychological likelihood of the other side to give up, or to run over time etc. 4.: Your score is designed in a way, that given optimal play the party with the higher score would win the game unless both parties have the same score, which results in draw. 5.: A "realy good" chess player knows if a game is diverted and will share the game with each other. Let S(t) be the score at the position, which should be mirrored. Lets assume the optimal strategy for both sides mirrors the situation at time S(t+m). Because our score does only take into account the position of the figures (see assumption 2) and all figures have the same possible moves from the mirrored position (see assumption 3) S(t)=S(t+m). The side which is aimed to win the game could have done so from the position at time t (because all figures have the same possible moves from the mirrored position). So we need a situation, where our optimal strategy for both sides from this situation is only preventing the other side from increasing the own score. This results in both sides to never increase the own score. So you need a situation which results in infinite repetition of the mirrored positions. After assumption 5 this will result in sharing the game being the best strategy. Which means that you will never see the mirrored situation. I hope this helps you to define things in a way, that makes discussion about possible solutions with "yes" possible! Disclaimer: Not a native speaker. I therefore welcome comments on language improvements or edits regarding this. My initial thought was no. 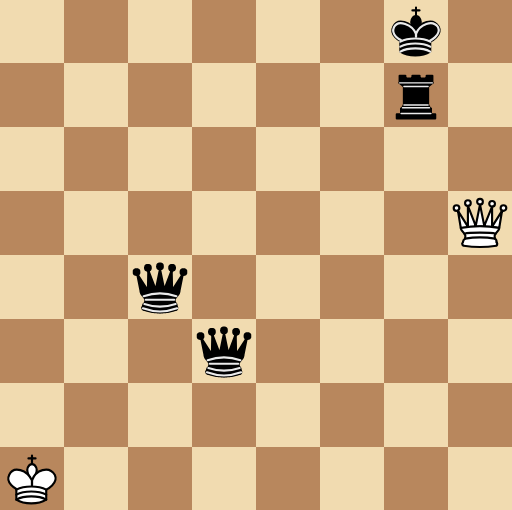 With the limitations of 3-5 pieces, and no pawns, you would only have a K+Q v K+Q or K+R v K+R, otherwise you have insufficient mating material. Most of those positions have been proven to be draws. However, after some thought, here are 108 possible initial, mirror positions, with the King on one of the first 3 rows, either next to, directly behind, or diagonally behind, the Queen or Rook. Play could continue with the Kings mirroring their moves behind and diagonally behind the piece, or next to the the piece, if the piece is on the 2nd or 3rd row, until the position has been repeated 3 times. The moves aren't forced, and they aren't the only possibilities, but a draw is the optimal outcome, and those moves retain it. Not the answer you're looking for? Browse other questions tagged chess or ask your own question. How did four chessmen disappear?